As the NFL Combine training moves forward each day we see the statistics of top recruits for the 2015 Draft. 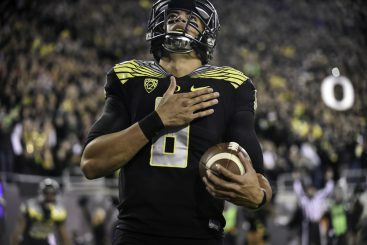 Of course, as Oregon fans and more so, Marcus Mariota fans, this is a huge year for Oregon attention. Yesterday Mariota ran his 40-yard dash and did very well. He ran an impressive 4.52 second dash and beat out Winston by a nice margin. For those of you who don’t know much about how the Combine works… well you’d be just like me because I had never paid it any attention until this year. Reporting for FishDuck.com has definitely broadened my knowledge in everything having to do with sports ten times more and I love every second of it. Basically, the NFL Combine consists of 300+ future NFL prospects for the upcoming draft. Oh, and not to mention, athletes are only able to participate if they received an invitation. In this event players go through all kinds of different professional level training, drills and routines. They are weighed, measured and put through various types of strength testing, field scenario play and mental tests. Throughout the entire event they are being watched by hundreds of professional scouts taking note of every positive and negative move they make while they have their eyes on each athlete. Not to mention more cameras recording them than they have ever dealt with before, more reporters and more overall pressure in general. All that for basically a football camp that helps determine the destiny of each athlete’s future. Crazy, huh? Marcus Mariota in 2014 game against Stanford. 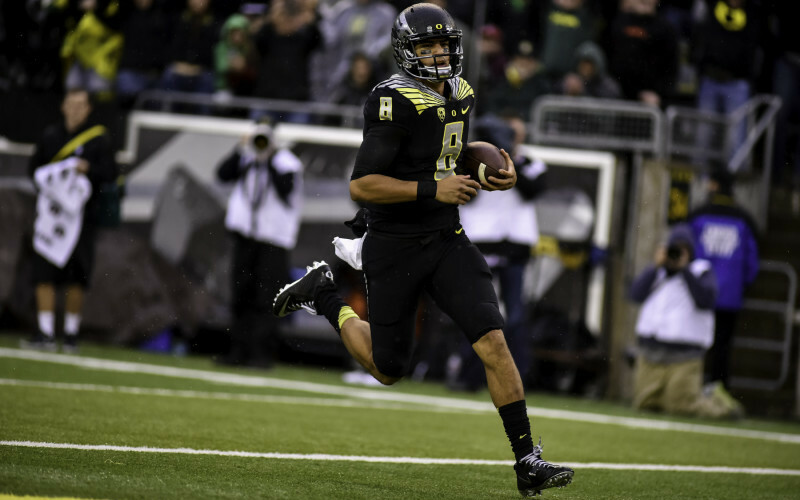 Now, let’s think about who Oregon’s most beloved NFL prospect is (and who is rumored to go in the top six picks in the 2015 draft): Marcus Mariota, the most humble guy known in the world of football. 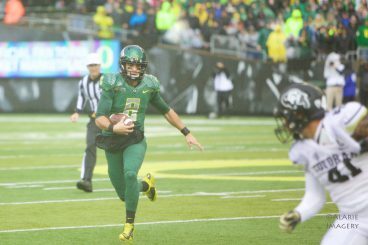 Throughout Mariota’s college career we watched as he always moved the attention away from himself, gave more credit to his team and coaches than to himself, heck he didn’t even want a Heisman-winning campaign because it put him too much in the spotlight! But in an interview on NFL.com, we see Mariota break out of his shell a little bit. Mariota: “While working with Kevin O’Connell, he’s given me a play sheet and at night he tells me to read the play calls out loud…” Mariota was then asked if huddling will be new for him and he responded saying that it will as he hasn’t done it since high school. Marcus Mariota in 2014 game against Colorado. To watch the rest of Mariota’s Combine interview, visit NFL.com, as well as keep yourself up-to-date on how he and the other former Ducks are doing in their training!